The most famous physician Dr. Paracelsus in Switzerland once said, “The heart heals the heart, the lungs heal the lungs, the spleen heals the spleen, like cures like”. Dr. Hunt used pheasants to successfully complete experiments related to regenerative and replaceable testicular transplantation. Med. Dr. Hahnemann from Switzerland was the first to treat human diseases with organ tissues, also known as “SUIS”. “Organ transplantation” involves the use of organ (gland) planting to treat diseases. Whole-gland transplantation (such as testis and ovaries) has received much attention. At the time, Druz, a Russian surgical medicine professor, successfully transplanted the testes of monkeys into the bodies of elderly men, which caused a stir. Initially, Professor Dr. Paul Niehans was performing whole-gland transplant surgery. Later, his partial organ transplant surgery successfully replaced whole-organ transplant treatment at the time, ultimately laying a solid foundation for cell transplantation in place of partial organ transplantation. French Dr. Luis Pasture was a great disinfection and sterilization inventor. His techniques are applied in dairy product pasteurization even to this day. However, at the beginning of the 20th century, he also went with the flow and followed the trend to learn gland transplant surgery. Cell therapy was developed by Swiss surgical medicine Professor Dr. Paul Niehans, with brilliant research results in terms of “whole-organ transplantation”, “partial organ transplantation” and “planting of muscles after organs or tissues treated with silver”. He also exchanged ideas on glandular disease research with Prof. Dr. Cushing, a well-known endocrinologist in New York City. Swiss Surgical Medicine Professor Dr. Paul Niehans implanted eosinophils in the anterior pituitary gland into a 10-year-old dwarf, which increased the dwarf’s height by 32cm. 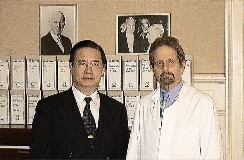 Swiss Surgical Medicine Professor Dr. Paul Niehans was widely recognized for this therapy and gained enormous public credibility. Therefore, Prof. Dr. De Quervain recommended a female patient who suffered thyroid surgery failure to Niehans. Due to the damage to the thyroid tissues and parathyroid glands, the patient suffered severe paralysis and was dying. Niehans performed “parathyroid cell suspension” injections on her and saved her life. It was further confirmed that partial organ planting and planting of smaller units of cells derived at the same result. Fresh living cells were used to perform this surgery, needing two operation rooms at the time. In the 1940s of the Second World War during Adolf Hitler’s massive invasion, the vast battlefield was in urgent need of military supplies and meat preservation became the biggest problem. Therefore, scientists researched on preservation by means of lyophilisation to solve this problem. After the end of the Second World War, Vevey Town was where DR. Paul Niehans practiced medicine, and n ext to the town was where world-famous Nestle General Foods Company Headquarters was located. He had the privilege of working with Mr. Joahim Stein from that company and successfully developed lyophilisate cell injections through concerted efforts. The 12th Pope of Vatican fell into serious illness, and Rome cordially invited Dr. Paul Niehans to perform cell therapy to treat the pope’s disease and restore his health, which enabled him to continue his religious service for more than seven years. 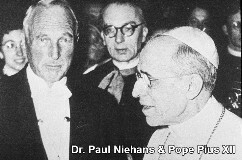 Pope XII nominated Dr. Paul Niehans as a member of the Scientific Committee of the Roman Church. At the time, Prof. Dr. Alexander Fleming who invented “penicillin” to become the “father of antibiotics” was also a member of the committee. Prof. Dr. P. B. Medawar was the winner of the 1960 Nobel Prize in Medicine. However, he suggested in his book “The Uniqueness of the Individual” in 1957 that living tissues that underwent vacuum lyophilisation could reduce immune rejection. As far as the cell structure is concerned, lyophilisation is the most gentle and perfect treatment. This book gave recognition to the lyophilisation preparation of Dr. Paul Niehan even before Prof. Dr. P. B. Medawar won the Nobel Prize in Medicine. The peak period of cell therapy is marked by “rejuvenation” and “anti-aging” therapy. Many of the then politicians, movie stars and high-profile celebrities received treatment, such as Vatican Pope Paul XII, Churchill, Duke Windsor, Eisenhower, Kennedy, Rockfeller, Onassis, Marcus, etc., setting a trend for royalties to preserve health. Prof. Med Dr. Franz Schmid was a German pediatrician who specialized in genetic medicine and confirmed the medical theory of cell therapy. He used cell therapy to treat Down Syndrome, infant cerebral palsy, head injury (concussions), stroke, Alzheimer’s disease, Parkinson’s disease, Alzheimer’s disease, heart disease, myocardial infarction, immune disease, viral hepatitis, diabetes, sexual dysfunction, etc., all of which were corrected. Most publications, books and papers were in the German language. Med Dr. Franz Schmid often performed treatment in the clinic of his teacher Professor Med. Dr. Franz Schmid located in the Switzerland. Med Dr. Wallace Liu is the founder of Biocellec Inc.：He is a specialist who received comprehensive medical school training and practiced in well-known hospitals for several decades. He was also a member of International Association for Cytobiological Therapies. With more than ten years of experience in cell therapy.